One of my favourite snacks to make is deviled eggs. I didn’t grow up eating deviled eggs (in fact, the first deviled egg I had was at the ripe old age of 20), but something about their cool creaminess makes them one of my favourite comfort foods. 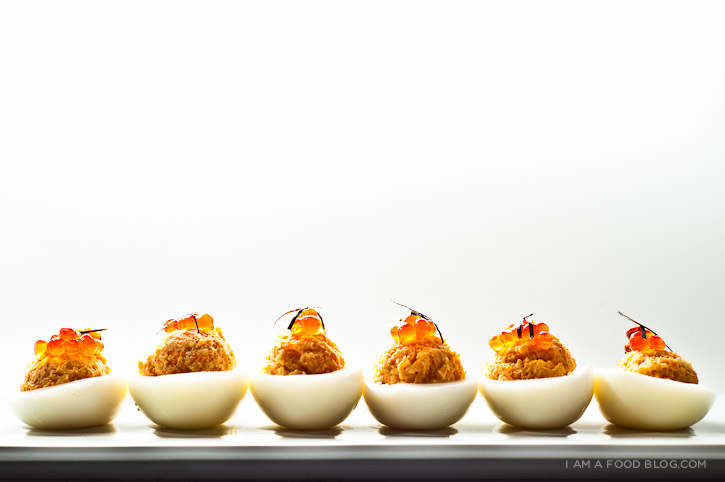 I love how deviled eggs can be dressed up or down – they’re pretty much a blank slate for flavours. 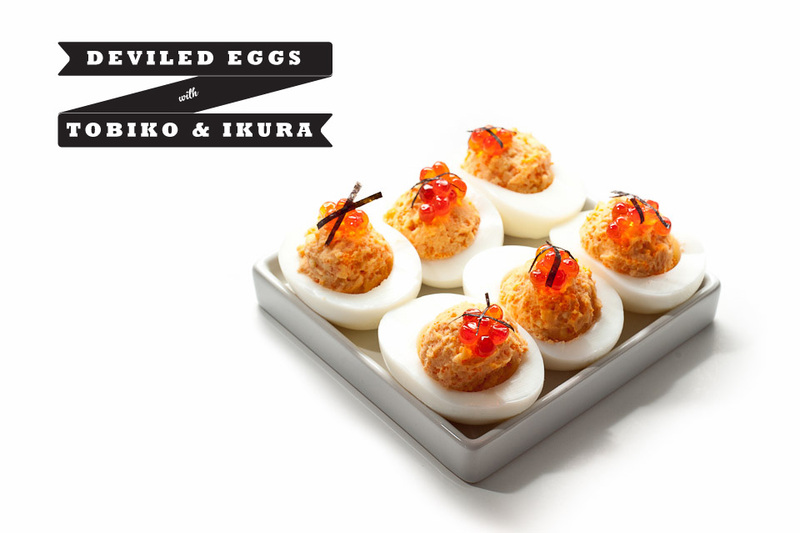 These deviled eggs are slightly Japanese due to the tobiko: those tiny, crunchy bright orangey-red fish eggs you usually see on sushi rolls. The eggs add a a fantastic texture and saltiness. Fast, easy and hand-held: the holy trifecta of snack foods, in my books. 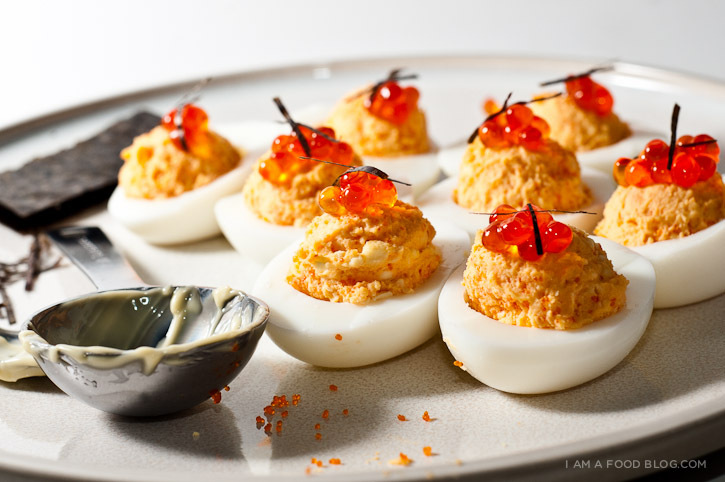 i am egg-filled, i am egg-topped: i am triple deviled egg! Remove the yolks from the egg halves into a small bowl. Mash the yolks with a fork until fine and crumbly. Mix with the mayonnaise and tobiko. Taste and season with salt, pepper and sriracha (if using). Fill the egg halves with the yolk mixture and top each egg half with some ikura and seaweed strips. Enjoy immediately. OMG these look amazing. I never like ikura but now I can’t get enough of it … though I am super picky about where I eat it. Just like with uni – only at higher-end Japanese restaurants. Ooh, these are really intriguing! They almost seem like a cousin of blinis with caviar and chopped eggs–albeit totally upended. I bet the salt & pop of the tobiko works super well with the rick yolk. OMG! I love your blog! so cool ! and love the pic too! 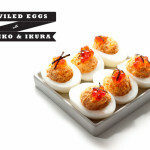 I want to try to make deviled eggs soon. I’ve never made them (I used to despire hard-boiled eggs, but have come around). I like your sushi-inspired take. That’s pretty original. I haven’t decided what kind of flavors I want in mine. Maybe something smoky. I love this recipe! So glad that I came across your blog and love the design of your blog! I tried it at my tea party at home last week and my friends love it! This is my first visit to your blog (drawn in by the spinach & potato coddled eggs) and I just love the blog design. There are SO MANY foodie blogs and pretty much never comment but on this one I felt that I had to. As someone going off on my own for the first time and previously raised on the versatile diet of McDonalds and Taco Bell, I’m so excited to know about this blog! I’ve been trying to learn how to make really good food for a while now and all of my mentors are proficient only at the microwave. This is one of the few “real” foods I ate growing up so I’m excited to try your take on it. The ikura looks especially good–I would have never thought to try that. Thanks for putting the site together! My eyes are really digging the aesthetics and I’m sure my stomach will appreciate the recipes. I made these for an afternoon tea party and everyone just loved them! Thank you for sharing this recipe.